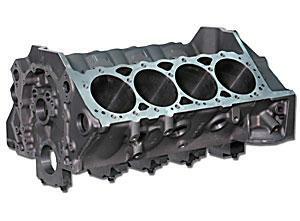 Why waste time sourcing, cleaning, machining, and prepping an old core in hopes it’ll be usable when you could be guaranteed a new quality block without the expense of a full-race unit? Dart “SHP” Special High Performance Blocks enable you to affordably build a powerful and durable engine. Designed for high performance and heavy duty applications producing up to 600 horsepower, the SHP block is the ideal starting point for hot rodders, drag racers, circle track competitors, off-roaders and high performance marine enthusiasts. OE bolt holes for starter, clutch ball, etc.